Believe it or not, I kind of feel a little sorry for Ed Sheeran. See, like the majority of the world, I discovered Ed Sheeran through his breakout hits 'The A-Team' and 'Lego House' and immediately dropped him into the 'white guy with acoustic guitar' subgenre for which I just don't care. But to be fair, Ed Sheeran was one of the entries in said subgenre that stood out as better than average - he came across as sincere, he wrote some interesting melodies, and he was willing to take some risks with the subject matter in his songs. Take 'The A-Team', a song where Sheeran sings about a dying crack addict - and then frames the song as a classical tragedy. Maybe it's just me living in Toronto the last two years, but when I think of crack addicts, the image is less of 'an angel in white' and more of a fat belligerent mayor who became an international laughing stock and yet will likely win re-election because... Toronto. But putting that situation aside, it turned out that the image of Ed Sheeran that I originally formed from his singles wasn't quite accurate, because while there still was the sincerity and acoustic elements, there was also a fondness for hip-hop on that first album that reminded me a lot of early Jason Mraz albums with the actual courage to step into slightly edgier subject matter. The hodgepodge of influences painted the picture of an interesting songwriter who was too sincere and awkward for his own good and whose occasional offbeat goofiness or darker touches made him hard to nail down. But at the same time, those strange dichotomies, awkward lyrical choices and pop culture references also made Ed Sheeran a little hard for me to take all that seriously - which is a shame because on some level, I kind of like the guy. I don't think he'll ever be an act I can consider as 'cool' or more than a fun oddity, but I respected his creativity and honesty, and thus was curious what would happen with his second album, x. What did I get? Well, certainly an interesting record, that's for sure. I'm not sure it's a great record, or that there's any one song on this album that's better than 'Lego House', but it shows Ed Sheeran taking more risks as a performer and expanding his horizons in terms of his producers and instrumentation. However, I'm not quite sure the shift in his songwriting is precisely for the best, which means that as a whole I'm a little colder on x by Ed Sheeran than I'd like to be. I should explain, and let's start with Ed Sheeran himself. Like always, he's got a natural gift for sincerity and honesty that lends a lot of colour to his songs and the more soulful and passionate moments on this album do feel organic and earned. And while I doubt I'll ever really be a fan of his rapping cadence, I will give him credit for having an expressive emotional range, and his delivery does a fair bit to elevate some pretty boiler-plate love songs, like 'One', 'Tenerife Sea' and 'Thinking Out Loud'. And when he's required to sell pain or darker emotions on songs like 'I'm A Mess' and 'Bloodstream', he's surprisingly capable. But this same sincerity undercuts any song where he's trying to come across as cool, and it makes songs like 'Sing' come across as more than a little awkward - which to be fair, I think Sheeran knows this and tries to play it as more of a joke, but it still comes across as a little clumsy. Granted, that might be more of an issue with the production, which ventures between acoustic folk, tighter hip-hop, and even elements of soul. And of the three, the folk is probably the easiest fit for Sheeran, with the guitars getting a lot of texture and balance in the mix and with some great keyboard and strings tones to back them up, especially on 'Afire Love'. Now that's not saying the hip-hop-inspired tracks are bad - 'Don't', 'Nina', and 'The Man' have some solid melodic lines and the gentle elements of the production add a lot of support to Sheeran's smoother vocal tone. Surprisingly, the producer whose work feels most out of place is Pharrell on 'Sing' and 'Runaway', because with the stiff, brittle percussion, slightly thin vocal production, and tighter, regimented grooves just don't compliment Sheeran's voice at all. It doesn't help that the melody lines on these tracks feel surprisingly clunky, especially on 'Sing', which isn't a bad shot by Sheeran at a dizzy club hook-up song lyrically but feels incredibly clumsy everywhere else. But outside of that, the one production element that repeatedly jumped out at me was the multi-tracking of the vocals, which becomes impossible to ignore given their prominence in the mix - and while I will give Sheeran a lot of credit for the harmonic arrangements, there are moments where they become a little too schmaltzy for my tastes. But coming back to lyrics, let's dig into what Sheeran serves up this time - and for the most part, what he delivers is what you'd expect. His love songs are often clumsy, but filled with enough mundane details to make them seem sincere - and for me, they're easily the least interesting songs on this album, mostly because they lack the nuance that Sheeran is more than capable of bringing to his songs. Granted, there are a few moments that hold together well - both 'One' and 'I'm A Mess' have a desperate sense of despair as Sheeran stumbles home drunk or into the inevitable breakup that he knows full well is his fault. Indeed, a running motif of this album is alcohol abuse, his own in songs like 'One', the spiraling-out-of-control song 'Bloodstream', and the mid-life career crisis moment in 'The Man', or his father's drinking in 'Runaway' - and what's telling is Sheeran's framing, because it really does show evidence of the love/hate relationship he has with booze, half because he knows how it affects himself and his family, and yet relies on it anyway. But more than anything, this album is a snapshot of Sheeran's life now - and if there's an album that makes his discomfort with fame all the more plain, it would be this one. 'The Man' is the simplest example, as he wonders if he's cut out to be a superstar and even admits he lies in the chorus in the same song to render his kiss-off all the more hollow. It also renders the curdled frustration in 'Don't' a little more palatable, a song suspected to be addressed at ex-girlfriend Ellie Goulding as he describes the failure of a relationship in stark, honest terms. 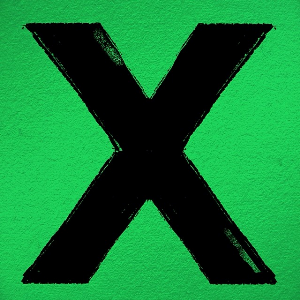 And to give Sheeran credit, it's the honesty that saves these songs from being a little insufferable - a track like 'Nina' where he tells off an ex who isn't over him could be a little hard to stomach if it wasn't for the fact that he lays his cards on the table and admits that he puts his career first. But there's something about the musical framing of these tracks that, well, kind of unnerves me a little, in that whenever he says or does some admittedly dark things, he never really has the courage to outright cast himself as the problem or take that extra step to strip out the elements that could be construed as romantic. In other words, there's none of the subversive elements that made 'Lego House' so powerful, the desperate darkness that underscored a song that might on the surface seem romantic. A prime example of this is 'Afire Love', a song that's probably my favourite on the album in terms of composition and the fact it tackles his grandfather's Alzheimer's and death... but at the same time, it still has that love song chorus, even if it was something his grandfather used to say to his grandmother. To me, that feels a little calculated to me, and pulls away some of the emotional impact. And yet at the same time, it's also the only song on the record that tells a story about someone outside of Sheeran and his relationships, which is a little exasperating considering for all of his musical experimentation, the scope of his songwriting seems to have shrunk. But in the end, x by Ed Sheeran is an interesting album without being a great one, and I'll admit I'm a little torn on how to rate it. I really do love Sheeran's sincerity and his gift for melody, but his songwriting can be clumsy, his framing can be muddled, and not all of his production experiments work. On top of that, while I do think his love songs are better than most of his 'white guy with acoustic guitar' peers, they also seem to be falling into a holding pattern. And I can't exactly say the tracks on this album influenced by his association with Taylor Swift like 'Don't' or 'Nina' are exactly flattering pictures for him - even though those unflattering pictures might be intentional. And yet there's also the fact I'm definitely not in Sheeran's target audience, and that some will definitely find his simpler love songs charming - but then again, I can only speak for me. So on that note, it's a 6/10 from me, BUT a recommendation if you fall into this album's demographic, or you're more of a fan of this subgenre than me. If you don't fall into either category... well, it might not be a great listen, but in comparison to some in this subgenre, at least it's honest, and at least it's interesting. I suppose my problem with Ed Sheeran is the same problem I have with guys like Philip Phillips -- I get the hate for guys like Jason Mraz or John Mayer but I at least can recognize their own unique artistic identities. But with these guys? I just hear them wearing their influences on their sleeves with their generally faceless songwriting and guitar playing. Their relatively generic voices don't really help things. P. S. Some shameless self promotion: I'm starting a blog of my own where I'll review books, singles, albums and whatever else. It'd be cool if you'd check it out sometime.